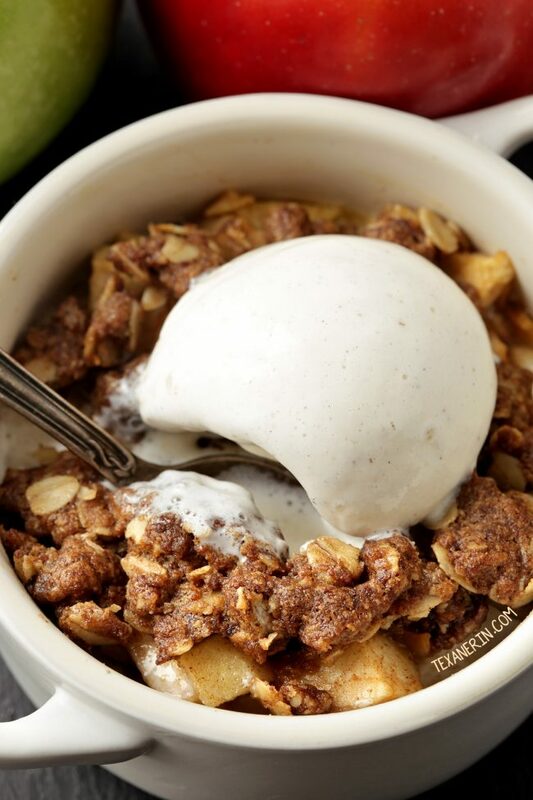 This gluten-free apple crumble is perfect for a last-minute dessert craving! They’re made with oats and oat flour, making them 100% whole grain, too. With a vegan option. These little gluten-free apple crumbles for two are perfect for when you’re not feeding a crowd. If you have guests, you can double the recipe and have four individual servings and you could even halve the recipe, but I don’t recommend that. You’ll want the second one later! And they stay good for several days in the refrigerator so you can always keep it around for when the dessert mood strikes. I first made this gluten-free apple crumble with butter and then realized it’d probably be pretty simple to make a vegan and dairy-free version. So I used coconut oil and it worked well! I do prefer the apple crumbles with butter, though. The topping seems to hold together better. Maybe it’s because coconut oil is 100% fat and butter is only 80% but I can’t say for sure. I reduced the coconut oil by just a little bit and that helped with the holding-together thing but the topping still isn’t quite as firm as with butter. 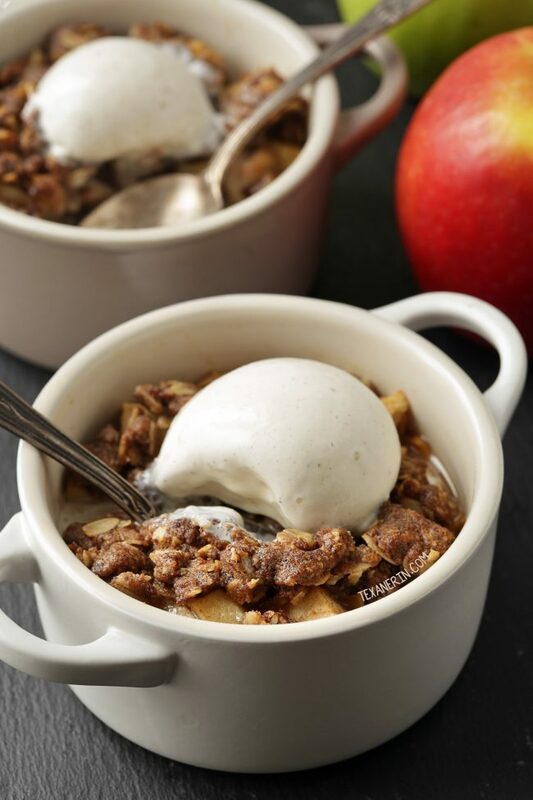 For another apple dessert with delicious crumb topping, try this Dutch apple pie or this Low-Sugar, Flourless Apple Crisp (which is also gluten-free and vegan!). Note: The pictures were updated in September, 2016. Preheat the oven to 350°F (175°C) and grease 2 one-cup ramekins. Prepare the topping. In a small mixing bowl, mix the dry ingredients together and then add the melted fat. Set aside. Prepare the filling. In a medium mixing bowl, mix together everything except for the apples until well combined. Stir in the apple chunks and stir to coat. Divide the filling between the two prepared ramekins. Sprinkle the topping evenly over the top of each one. Place the crumbles on a baking sheet (just in case there are any spills, which there shouldn't be). Bake for 22-26 minutes or until the topping is firm and golden brown. The apples should be bubbling. Serve immediately or cool and cover and refrigerate any leftovers for up to 3 days. I use refined coconut oil, which has no coconut flavor. If you use unrefined, there may be a coconut taste. For a vegan or dairy-free version, you must use coconut oil. 60 comments on “Gluten-free Apple Crumble (vegan option, whole grain)” — Add one! Oh wow, does this ever look so good! I definately need to re-do my apple crisp recipe! I am now craving all things apple! Your crumbles look amazing and I’ll take mine with a scoop of vanilla!! OK, everyone likes this because of the individual servings. But, do you think it’d work as well if I double it and put it all in one pan to bake? My Friday treat!! Turned out to be sooo good. Will definitely make this often. I’m so happy that it came out well for you! And awesome that you like it enough to make again. :) Thanks so much for the feedback! I made this tonight it was delicious! I’m trying to eat healthier and this hit the spot perfectly compared to my alternative options I’ve had in the past. 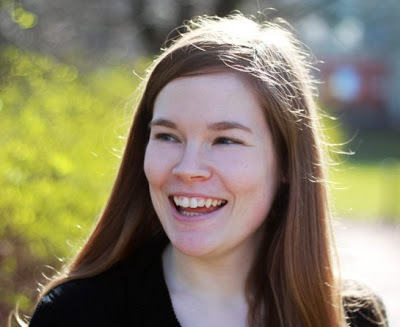 Thanks for your hard work and sharing! I’m so happy that you liked it and that you found it better than other healthier recipes! That’s awesome. :) Thanks so much for your feedback and for your kind words! Crumbles are my absolute favorite dessert to make! They’re so easy and this one looks seriously scrumptious! Delicious, Erin!! Those pots are super cute, too. I’ll try to make this this coming weekend (when I have a bit more time on my hands). I love your serving suggestions, too!! Holy wow! 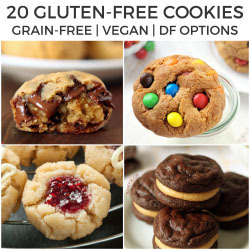 I can’t believe that it’s gluten free, it looks sinful! I’m in love! Holy moly… ok, this is making me drool in a big way. I love individual size anything! And I’ve been looking for good GF dessert recipes to have in hand for the holidays so this is great! That oat crumble topping looks AMAZING! Erin – Apfelstrudel and ice cream is the only exception :) Friends of mine were in Germany this past summer and they wanted a scoop of vanilla ice cream with Kuchen. You know the answer, right? No! Nur Apfelstrudel…but so it goes that I do not really like ice cream on anything baked either. Well, I probably need to correct that because your Apple Crumble topped with ice cream and caramel sauce looks out of this world.! Haha. Those silly Americans! How could they ever want ice cream on their cake?! ;) That’s so funny that they were actually told no! Loving ALL of your ingredients! I am already licking my lips. Nothing beats desserts in single servings! I adore fruity desserts, so this apple crumble is right up my alley! The individual servings are so pretty and I love that you crumble looks to-die-for! I love recipes made once and enjoyed twice. I wouldn’t be sharing this, I’d save the second one for my dessert the next day! YUM! These look delicious and I love the individual portions. As much as I love crumbles, I’m with you – brownies and cookies never get old! I’m exactly the opposite – I never get sick of crumbles or similar fruit desserts. This sounds amazing! Warm and with ice Cream for me (and I’m even part German) ;). This looks like the perfect fall dessert for two! I love love LOVE that this is for 2!!!! Is it bad that I want this for breakfast? Looks amazing Erin! Love how small these are – and so delicious looking! Yum! These crumbles are now my new Fall craving. This looks so delicious. Love apple crisp and peach too. Just wanted to tell you I made whole wheat, spelt, and kamut cranberry, orange, walnut, and coconut cookies the other day. Oh my goodness they were out of this world good. My husband was home when I took them from the oven. Too good!!!! I forget how many he ate. I love a single serving dessert, they help with portion control and are so much faster to make. 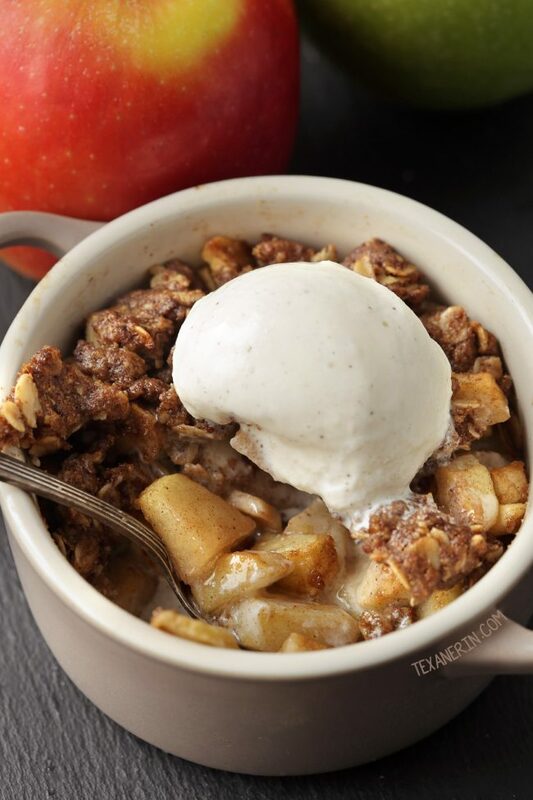 This apple crumble looks amazing and you can’t go wrong with this ingredient list! The maple syrup is a great touch and that ice cream sounds divine!! Can’t wait to see that recipe. Thanks, Sam! I’m with you on the portion control thing. I have a huge problem with that!